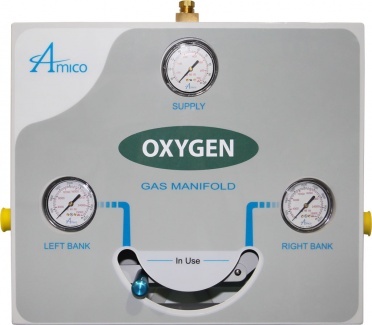 The Amico Economy Manifold incorporates the basic necessities for distribution and monitoring of gas throughout a facility. The Manifold is semi-automatic and shall switch from “In Use” bank to “Reserve” bank once the “In Use” bank depletes. Manual operation shall be required at the time of changing cylinders to ensure that the “Reserve” bank is changed to “In Use”. The bank that has new cylinder(s) shall be the “Reserve”. A pressure switch controls the remote alarm which indicates the “In Use” to “Reserve” supply switch-over and that cylinder replacement is necessary. 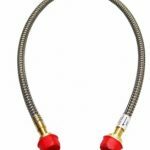 The pressure switch is set to trigger an alarm condition when the operating bank pressure drops pressure slightly above the secondary bank outlet pressure and just before the bank switch-over occurs. 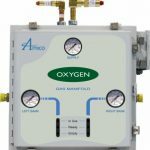 All Manifold regulators, piping and control switching equipment shall be cleaned for oxygen service.